The Bungie Mobile app is a newly created app for the iPhone, iPod touch and the iPad from the creators of the video game series Halo. The Bungie Mobile app is scaled down version of their website bungie.net. Bungie has stated that they wanted to start off with a small scale iPhone app, and they have succeeded. And just for downloading the Bungie app you get a free blue flaming helmet and an all-star nameplate to use. 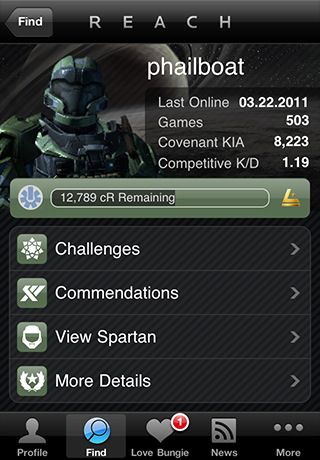 The Bungie Mobile app allows anyone to view their stats, commendations and challenges of the game Halo: Reach on the Xbox 360. The same information is also available on all of your friends, and will even tell you if they are currently online playing the game. Bungie Mobile also gives you instant access to the news feed found on Bungie’s website. All of this makes this app a must-have for any fans of Bungie and the video game. 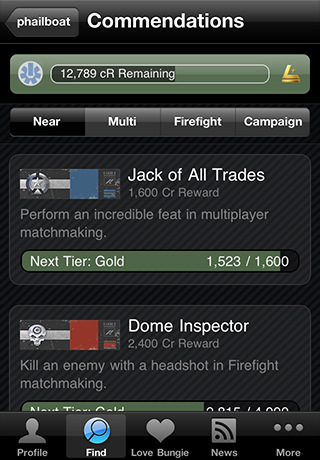 The only problem with Bungie Mobile is that it only gives stats on Reach and not any of the previous games in the series. This will only be a problem to a select amount of people because most have switched over to playing Reach and have stopped playing the older games. There is not much to mention about the controls and the sound of Bungie Mobile. Since it is not a game, there is not audio on the app. Bungie Mobile is very easy to navigate, and all of the information is presented in a manner that is easy to find. The app runs smooth on the iPhone with no slowdowns. This makes it easy to check the latest information without spending much time. All of the graphics in Bungie Mobile are crisp and clear. The text is large which makes it easy to read for anyone. All of the information is presented in a very stylish way that you would expect from Bungie. There is an option on the app to view your current spartan model in the game. The spartan is shown is great detail and looks exactly as it would while playing on an expensive high definition television. The Bungie Mobile iPhone app is a huge value for any fan of the series. There is not much more that you can expect to see from a free app. Bungie has created a small app, but have pack a lot of information in the small package. Bungie Mobile eliminates the need to check Bungie’s website or your Xbox for all of the needed information on Reach. This app is perfect for anyone that plays the video game. Reach has a large cult following, and Bungie Mobile will surely satisfy all of them. There could have been more information put in the app, but there is little to complain about the price. AppSafari review of Bungie Mobile was written by Darius Reimm on June 16th, 2011 and categorized under App Store, Free, Utilities. Page viewed 3696 times, 1 so far today. Need help on using these apps? Please read the Help Page.